When the .NET client invokes a MATLAB® function through a request and receives a result in the response, data conversion takes place between MATLAB types and C# types. There are many data types, or classes, that you can work with in MATLAB. Each of these classes is in the form of a matrix or array. You can build matrices and arrays of floating-point and integer data, characters and strings, and logical true and false states. Structures and cell arrays provide a way to store dissimilar types of data in the same array. All of the fundamental MATLAB classes are circled in the diagram Fundamental MATLAB Data Classes. Function Handles are not supported by MATLAB Production Server™. Each MATLAB data type has a specific equivalent in C#. Detailed descriptions of these one-to-one relationships are defined in Conversion Between MATLAB Types and C# Types. 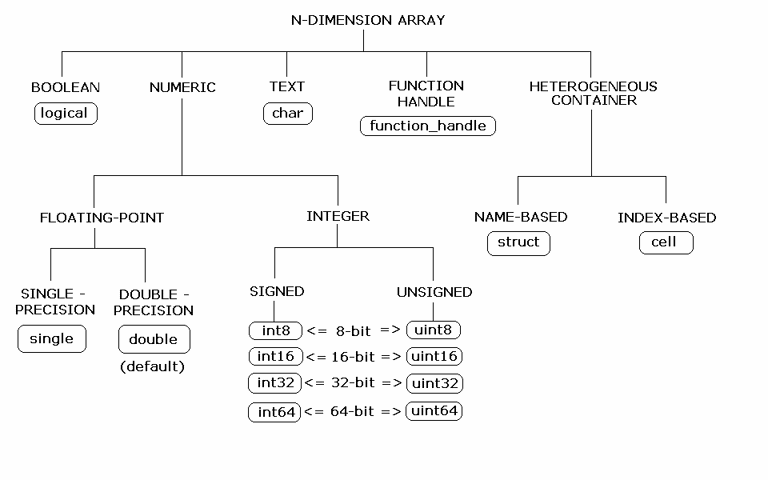 Scalar numeric MATLAB types can be assigned to multiple .NET numeric types as long as there is no loss of data or precision. The main exception to this rule is that MATLAB double scalar data can be mapped into any .NET numeric type. Because double is the default numeric type in MATLAB, this exception provides more flexibility to the users of MATLAB Production Server .NET client API. MATLAB to .NET Numeric Type Compatibility describes the type compatibility for scalar numeric coercion. In MATLAB, dimensionality is an attribute of the fundamental types and does not add to the number of types as it does in .NET. In C#, double, double and double[,] are three different data types. In MATLAB, there is only a double data type and possibly a scalar instance, a vector instance, or a multi-dimensional instance. How you define your MATLAB function and corresponding C# method signature determines if your output data will be coerced, using padding or truncation. This coercion is performed automatically for you. This section describes the rules followed for padding and truncation. Multidimensional arrays of C# types are supported. Jagged arrays are not supported. When a C# method's return type has a greater number of dimensions than MATLAB’s, MATLAB's dimensions are padded with ones (1s) to match the required number of output dimensions in C#. When a C# method's return type has fewer dimensions than MATLAB’s, MATLAB’s dimensions are truncated to match the required number of output dimensions in C#. This is only possible when extra dimensions for MATLAB array have values of ones (1s) only. From the middle of the array (scanning front-to-back). Empty MATLAB data is returned to C# as null for all the above cases.